There is no road to Purros; only the ruts of old tyre tracks disappearing westward into the mountains and deserts of Kaokoland. Purros itself is nothing but a scattering of shacks and mud huts belonging to the Himba, nomadic pastoralists who dress in skins and roam the hills with their scrawny goats. Coulson should know. He has been travelling around Namibia for years, recording its rich heritage of African rock art. But even as he speaks the first fat spots begin to fall and moments later we are in the thick of a ferocious tropical storm – and it is precisely at this moment that fate decides we should have a puncture. There is nothing for it but to leap out into the lashing rain and change the wheel. Within seconds we are soaked to the skin. When at last the wheel is fixed I unlace my desert boots and hold them upside down to pour the water out, and think to myself what an odd way this is to begin a journey into one of the driest and most inaccessible places on earth. Namibia is the last great wilderness in southern Africa and much of it is desert. Some of its rivers do not run for years, and in some places no rain has fallen for almost a century. To explore such demanding terrain requires local expertise, and that is why we are heading to Purros, to rendezvous with Louw and Amy Schoeman, who are going to take us to the Skeleton Coast. The Skeleton Coast National Park is a strip of desert up to 25 miles wide, running south for some 300 miles from the Kunene River on the Angolan border to the Ugab River, near Cape Cross. When the park was proclaimed in 1971 it was decided to set aside the northern sector as a wilderness area where only limited tourism would be allowed; and in 1977 it was Schoeman, a practising attorney and one-time diamond prospector turned tour operator, who was awarded the concession to operate fly-in safaris there. From Purros we follow Schoeman across what he thinks of as the most beautiful land on earth, traversing immense gravel plains with no sign of life except a few springbok and ostrich on the farthest horizons, until we come at sunset to his lonely camp on the edge of the Khumib River. The river had flowed a month ago after heavy storms in the mountains up country, says Louw; but now it is bone-dry again. The mess tent stands under the spreading branches of an ancient omumborombonga or leadwood, the holy tree of the Herero people, who believe it to be the ancestor of all life on earth; and at suppertime a pair of shy, spotted genets emerges from its branches to wait for scraps. When I go to bed, ducking into my low-slung tent, I fancy I can smell the sea on the night breeze, even though the coast is a good eight miles away; and sure enough, when I awake in the stillness of dawn I can hear the dull roar of the Atlantic surf, like the distant drum roll of a passing jet. After breakfast, before we set out I am given a hat, a legionnaire-style kepi with a flap to protect the back of my neck from the desert sun, although Schoeman insists on going hatless, even on the hottest days. With his grey hair and avuncular manner he has the look of a country doctor; but in reality he is one of Namibia’s most experienced desert veterans, possessed of an endless store of knowledge gleaned from the barren world about us. We drive on through a desolation of barchan dunes – wandering sandhills that crawl across the desert floor before the prevailing southerly winds at the rate of as much as 100 feet a year. At first glance these shifting sands seem utterly devoid of life; yet every slope bears a scribble of tracks – signatures left by side-winder snakes, scuttling lizards and fog beetles, which collect the dew that condenses on their backs. In places the sands are stained a rich maroon, as if someone has emptied giant vats of claret down the slopes. Louw hands me a magnifying glass and tells me to take a closer look. With my nose in the sand I squint through the glass and see that each polished grain is in fact a miniature gemstone. I am lying on a bed of garnets. With Louw I learn the secret of driving in the dune-fields. You simply let down the tyres until they are like squashy balloons. Then, with the vehicle in four-wheel drive, you put your foot down and float through the soft sand with a sensation akin to skiing in powder snow. We walk down to a beach that is knee-deep in spume: an extraordinary phenomenon produced by the rich blooms of plankton that thrive in the cold Benguela Current. Whipped up by the surf to the consistency of shaving cream, it covers the shore in thick, quivering blankets, slowly breaking up in the wind to roll away like tumbleweed. Up and down the coast as far as the eye can see, the sands are littered with the flotsam of centuries; a tangle of ships’ masts, planks and spars, with here and there the bleached skeleton of a great whale, butchered by the American whaling fleets a hundred years ago. Kelp gulls watch us at a distance and ghost crabs tiptoe away over the sands like shadows; but ours are the only footprints. 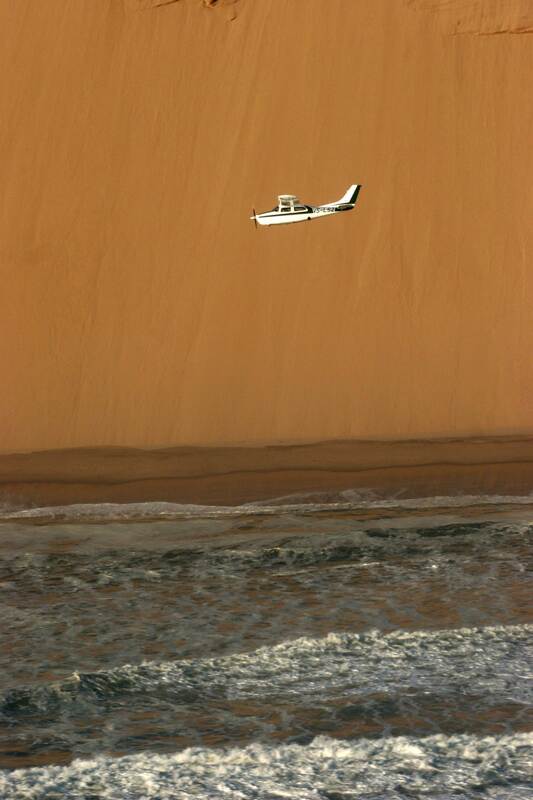 THE FOLLOWING DAY we fly up the Skeleton Coast on our way north to the Kunene River, where Schoeman has another camp overlooking the Angolan border. Below us are scattered more masts, more ribs and vertebrae and giant jawbones of the vanished whales. We fly low over a colony of Cape fur seals hauled out on the beach and narrowly miss a flock of rare Damara terns that rise from the water like a white cloud in front of us and go swirling past our wing-tips. Had we hit them it would have brought down our small aircraft as effectively as any ground-to-air missile, but Schoeman appears unperturbed, and I learn later that among his friends he is known as “low-flying Schoeman”. It seems impossible that there could be any safe place to land in this burnt and broken country; but eventually a strip appears and we touch down on a wide plain to step out into the blowtorch heat of late afternoon. A vehicle is waiting to take us to camp. Recent rains have raised a faint flush of green grass from the red sand, but already it is withering in the unrelenting heat. To the south, a range of nameless hills raises granite heads. Rock kestrels whistle among the crags and larks fly up as we drive along the stone ridges in search of a safe place to descend to the river, but their cries are torn away on the hot wind. By the time we reach camp the sun is setting. Shadows seep out of the ground like smoke, filling the hollows of the hills above the gorge in which the river is hissing and swirling in spate. There is a swimming pool among the rocks (the river itself is full of crocodiles), and although there is barely room enough to turn around, it is bliss to cool off and then sit with a cold beer and watch the lightning flickering in the mountains of Angola. Somewhere in those forbidding hinterlands is where the Kunene has its source in the same giant watershed that gives rise to the Zambezi and the Okavango. But unlike them, the Kunene flows westward to the Atlantic, forming one of the loneliest frontiers on earth. Next morning, Schoeman launches an inflatable boat powered by two giant outboard engines and we set off upstream, bouncing over the racing brown current in which fierce whirlpools spin and gurgle under our bows. After about a mile of this the gorge begins to narrow, causing the water to become even more turbulent as it tumbles towards us in a series of rapids. Here the river tries its best to unseat us, but we cling on grimly as the boat bucks and turns beneath our feet. Ahead loom towering walls of granite, closing in like the gates of hell. Somehow we squeeze through them and surge on past a chaos of sunless cliffs that have collapsed like a stack of giant dominoes, until our way is blocked by an enormous cataract and we can go no further. Once we are out of the rapids, returning downstream is far more enjoyable. Goliath herons flap out of the reeds and brilliant green-and-yellow bee-eaters sit on the swaying branches of the winterthorns above luxuriant tangles of morning-glory flowers. Back at camp we laze over a late breakfast, then leave the Kunene to fly back to the Khumib. Once more that savage northern landscape unfolds below, the sands a smouldering Martian red, the blinding soda pans, the mountains flayed by wind and sun. I am glad I have been to the Kunene, but at the same time I cannot deny feeling a sense of relief to be escaping from its brooding hostility. Extracted from Savannah Diaries by Brian Jackman (Bradt). 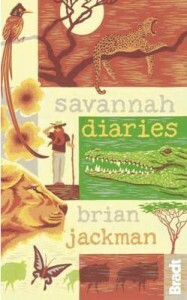 Brian Jackman is a journalist and author who has had a lifelong passion for travel and wildlife. His other African books include The Marsh Lions and The Big Cat Diary (both with Jonathan Scott) and Roaring at the Dawn. For more about his work, see his website.